Above picture shows the roundabout in Ruitz, a small community in the Nord-Pas de Calais area in northern France. As it was, in the mid 1960's. In 1968 this traffic circle was normalized and the sculptures were replaced by decent, twelve-in-a-dozen flowerbeds. Charles Pecqueur (1908-1990), the author of the decorated roundabout, was born in Bruay-en-Artois, a community in northern France, neighbouring Ruitz. Young Charles would not enjoy much schooling. World War I raged and the local school had been transformed into a hospital. Pecqueur was socially active, joined the resistance during WWII and after the war he was elected mayor of Ruitz, a job he held for some 18 years. 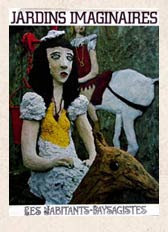 When in 1958 he retired from his job at the mines, Pecqueur developed a strong feeling about the importance of art in daily life, and although he had no formal training in the arts, as mayor he embellished the community with single-handedly made artistic creations, les beautés (the beauties) as he liked to call them. 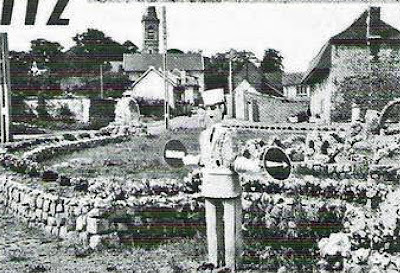 One of his creations, which still can be seen at the local cemetery, is a monument constructed in 1963 which could be used to temporarely store coffins. But his chef d'oeuvre in public space was the roundabout in Ruitz, as in the first picture, constructed 1965/66. Pecqueur single-handedly decorated the site with arches and sculptures made from various stony items and concrete. Local public opinion about Pecqueur's artistic activities was probably quite varied. In any case in 1965 he was not re-elected as mayor. Charles Pecqueur also devoted his artistic energies to decorate the entrance, the interior and the garden of the family house. By decorating the garden with frescoes he has become known in France as creator of an art environment, especially since his creation was described and analysed by landscape architect Bernard Lassus. As said in an earlier post, Bernard Lassus' study of french jardins insolites in the early 1970's, published in his book Jardins imaginaires (1977), has been an important factor in the rise of interest in environments created by ordinary people and self-taught artists. He coined the term habitants-paysagistes, which refers to urban residents (habitants), who transform the exterior of their homes into -creatively decorated- landscapes (paysages). Pecqueur from 1965 until 1968 decorated the garden with frescoes and sculptures, representing Popeye, Lafontaine's fable of the hare and the tortoise, and the story of Snow White. A detailed analysis (in english) of the Snow White frescoes is available on the internet in the study by Michel Conan, Landscape design and the experience of motion, 2003, p. 309-315. Indeed, Pecqueur's elongated decoration has been executed in the style of a comic book which produces a cinematic, motion rich staging. Pecqueur had a friendly relation with Caroline and Alain Bourbonnais, who in the 1980's founded La Fabuloserie, a private museum about outsider art and art environments. The next picture (2013) shows a scene in the outdoor-area of the museum: Caroline Bourbonnais with a sculpture of Snow White made by Pecqueur. a sculpture Caroline has posed for, such as Alain has posed for another sculpture by Pecqueur, currently still present in the collection. Pecqueur's frescoes on the wall of his garden are still extant (as about 2014), as can be seen on above pictures made in 2013 by Pieter and Rita van den Boogaart, Dutch members of the Folly Fellowship (founded in the United Kingdom) who had the opportunity to visit the site. The house is still within the family and actually is owned by Pecqueur's son Turenne Pecqueur, who is in his sixties. In an interview with a regional newspaper (August 2014) he says that he regrets that he has neither the artistic skill nor the financial means to maintain the frescoes. Uncertain with regard to the future of the frescoes and sculptures, Turenne Pecqueur is pleased with the attention the art environment received in the past by academic writers. In French circles of those who are interested in outsider art and in art environments, Charles Pecqueur's creation seems to have fallen into oblivion, unfortunately. But his decorated garden still exists. * Michel Conan, Landscape design and the experience of motion, 2003, p. 309-315.